I know Christmas is far behind us now, but I'm not done sharing my projects with you! An unfortunate reality of this past holiday season was that I was swimming in design team projects, gift exchanges, present wrapping, Etsy sales...and that doesn't even count all of the regular Christmastime things that go on--shopping, family, and making memories with the kids. I was spread pretty thin (much of it was my own fault for over-committing and I intend to approach the holidays very differently this year) so even though I was making, making, making, there wasn't much time for sharing, sharing, sharing. So, better late than never, right??? 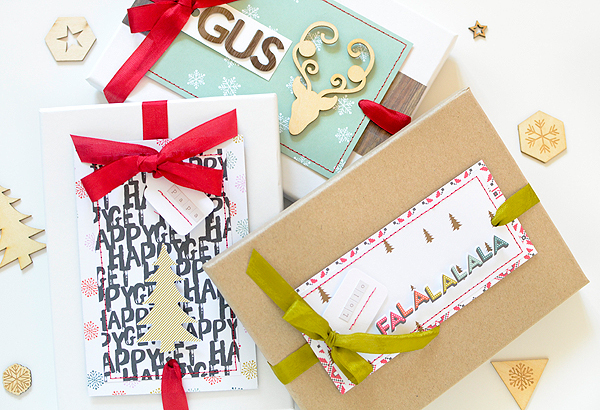 These gifts feature masculine wrapping using the Get Happy collection from Gossamer Blue. The gift card envelopes are the easiest things you will ever make but I love the way they turned out! All I did was take some Happy Pockets and add words to them. 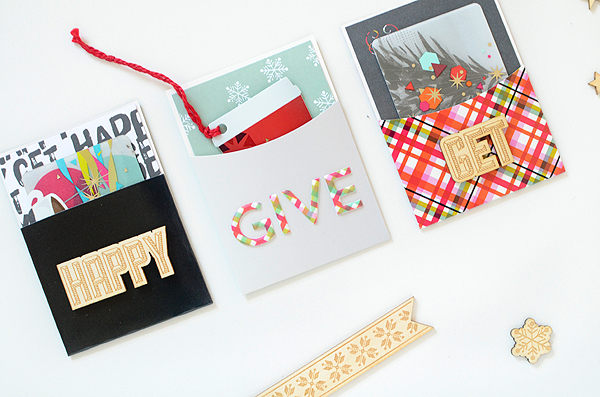 The wood words are from the wood veneer pack and "GIVE" is spelled out with the plaid alphas. 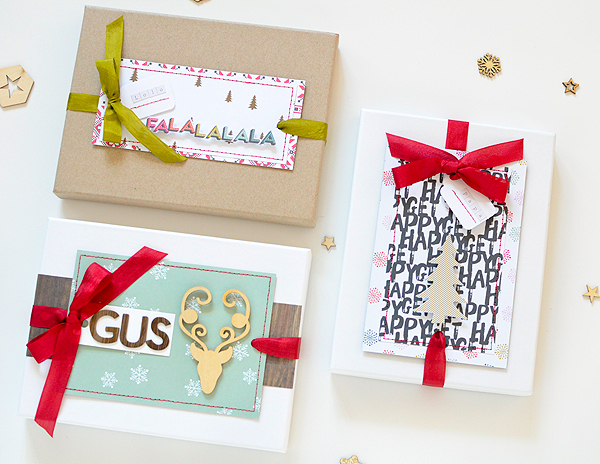 I slid patterned paper backgrounds behind each of the gift cards for a little extra interest. Again, everything I used here is from the GB Christmas collection, Get Happy. Next up are some decorated boxes, also made with the same collection. Patterned paper and stickers made up the bulk of these, but I wanted to add a ribbon wrap to them. By punching holes on either end of my paper, I ran my seam binding through one hole, underneath the card, and then up through the other end of it. I wrapped the length around the box, pulling it through the first hole again and securing it in place by tying a pretty bow. Before I tied the bow, I slipped on a simple name tag. When it comes to boys and men, I have found they aren't fussy so my gift wrap needn't be, either! But because I am who I am (a gift wrapper at heart), I do like to spend a little time on creating nice wrap for them--it's the nice thing to do, right? As always, I sincerely appreciate you visiting my blog and commenting here. It's nice to know I'm not blogging to just the crickets!